When it comes to eyeshadow palettes I think there’s quite a lot that can go wrong. I’m a bit of a snob when it comes to decent eyeshadows and so for me to really like an eyeshadow palette it definitely has to be a good’un. 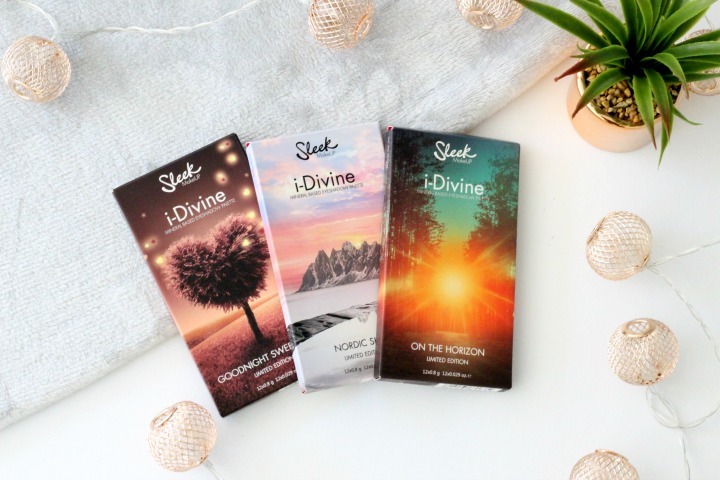 For some time now I have been a massive fan of Sleek makeup (as you must know if you read my blog frequently) and over the past couple of months the lovely people over at Sleek HQ have treated us good and proper with three (yes three!?!) new limited edition i-Divine Eye shadow palettes. I first heard about these a couple of weeks before they were due to launch as I was lucky enough to take a little trip down to London to visit Sleek’s PR company for a little meeting and I have been a little in love with these ever since. Between the three of them they definitely cover all avenues and every kind of shadow you could really want. 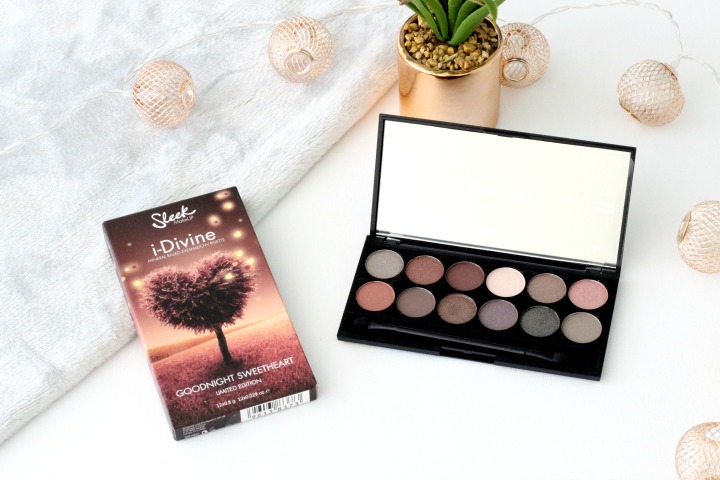 First up is the Goodnight Sweetheart Limited Edition eyeshadow palette which is exclusive to Boots; this gorgeous palette is full of perfect autumnal hues and is most definitely my favourite of the three new palettes. 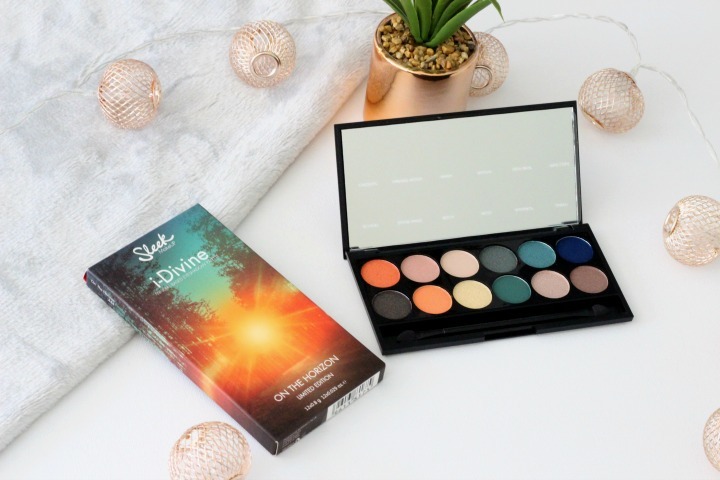 As with all of Sleek’s i-Divine eye shadow palettes, the pigmentation in these shades is incredible and they shadows themselves have a beautiful creamy consistency even though they are obviously powder shadows. They apply so easily to the skin and also blend really well which is always a massive selling point for a decent quality eyeshadow. I am obsessed with the purple / brown shades in this palette and just think it’s the most beautiful thing for this time of the year. Every single shadow in this selection is wearable and they all work so well together as well as on their own for a slick of block colour across the lid. The Goodnight Sweetheart palette is perfect for a smokey eye or a bit of subtle colour to add to a bold lip or a ‘no makeup’ makeup look and for £8.99 you can’t really go wrong! 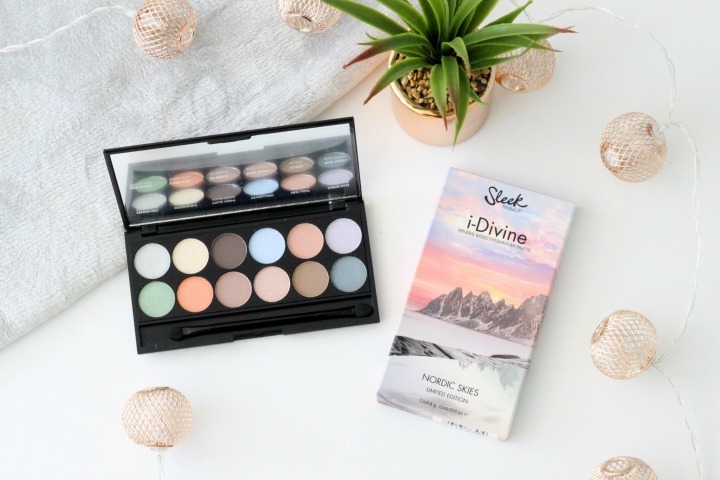 Up next and exclusive to the Sleek Makeup website, the Nordic Skies Palette is another beauty full of some of the prettiest and wearable pastel shades I’ve ever seen in an eyeshadow palette. These shades no matter how subtle or pale they may look, are just as pigmented as any of Sleek’s other shadows and are so easily build-able too. I am a huge fan of how easy these shades are to wear on an everyday basis and how pretty the colours are for a more understated makeup look. I wouldn’t say that I’d wear every shadow this palette has to offer personally as I’m usually into my darker and more neutral shades like in the Goodnight Sweetheart palette, however I have been loving this one almost just as much and have been reaching for it far more than I thought I would when I first had a play around with it! Last but by no means least, the On The Horizon palette is a beautiful palette full of brighter shadows and is exclusively averrable at Superdrug. This one has definitely been a bit harder for me to wear than the other two and I have only found myself picking this one up a handful of time since I’ve had my hands on it, but it still is absolutely stunning. I am obsessed with the orange shades and more neutral shades (as I always am) and I’ve found it really fun trying to add these into some of my brown / bronze eyeshadow looks thanks to the inspo from Kylie Jenners latest Kyshadow Bronze palette (review here) but I have to admit I still haven’t picked up the courage to use the blues or greens just yet. I would definitely pick up one of the others over this one for an every day palette, but for a night out and a slightly more dramatic look, then I think this palette is so much fun and I can’t wait to find a way to play around with it a lot more! As I say in nearly every Sleek Makeup review post, Sleek really do know how to impress with their products and I am so grateful to the lovely ladies at the PR team for gifting me these and letting me have a play around with them! You really can’t go wrong with Sleek products and especially for the price! I can’t wait to try out their next releases! Let me know in the comments which of the three above is your favourite!